Since 1999, the Société de Chimie Industrielle Fellowship has been granted every summer. A number of different types of researchers have used the fellowship to further the public's understanding of chemistry. The fellows have come from a wide range of backgrounds including historians, retired chemists, and independent scholars/freelance scientists. Together, these scholars have developed projects that reach a wide variety of people and expose them to a broad understanding of chemistry in everyday life. Additionally, these scholars have placed the chemist in historical perspective and promoted chemistry as a profession, particularly for women and minorities. The major source of outreach has been through websites, both for the general public and for university and secondary school students. Additionally, most of the scholars have presented their research at a variety of conferences including the History of Science Society, the American Chemical Society, and the Sustainable Resources Conferences. A number of publications have also resulted from the fellowship program. 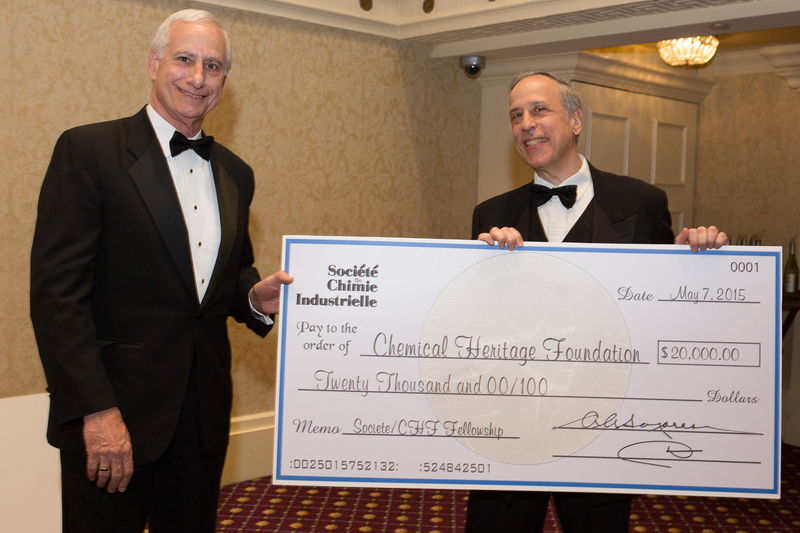 Marc Reisch, Chair of the Education Committee for Société de Chimie Industrielle, presents the Société /Chemical Heritage Foundation Fellowship check to Robert Kenworthy, Manager of Affiliate Relations for the Chemical Heritage Foundation at the 2015 International Palladium Medal Dinner.